Congenital problems such as aural atresia and microtia result in absent, small or abnormally formed ears. In a combined effort, our pediatric plastic surgeons and pediatric otolaryngologists work together to treat these conditions. Otolaryngologists focus on improving hearing while plastic surgeons can construct the external (outer) ear using cartilage and or Medpor, flaps and skin grafts and other techniques. Our audiology team provides cutting edge hearing technologies and work with renowned otologists who are skilled in such areas such as cochlear implantation, canal reconstruction and osseointegrated implants for hearing. Children with abnormally protruding ears or misshapen ears may also benefit from plastic and reconstructive surgery to improve appearance. We routinely perform otoplasties (ear shaping surgeries) and work with our partners in the Fresh Start Caring for Kids Foundation to provide free care in otoplasty when the surgery is denied by the families’ insurance carrier. 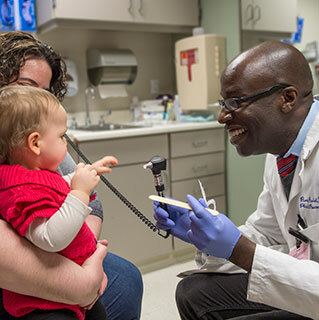 Our Craniofacial Anomalies Multidisciplinary Program (CAMP), one of the largest in the region, provides a thorough, team-based approach for the evaluation, diagnosis and treatment of children with craniosynostosis.